Spring is officially here. And while that’s terrific news for most people, you may be a little less excited if you suffer from allergies. This is the time of year that trees blossom, pollen spreads, and mold and mildew counts rise with warmer temperatures. While you can’t control the great outdoors, you can protect yourself from allergens inside your home. One way is by using the correct air filter in your furnace or air conditioning system. Here are five tips to help you breathe easier this spring. If you buy the cheapest air filter you can find, don’t expect it to protect you from allergies. Standard air filters aren’t only designed to remove large dust particles from the air and protect the HVAC system. To catch tiny participles like mold, bacteria, and pollen, you need a HEPA filter, which stands for high energy particulate air filter. Unlike standard filters that are usually made with paper, HEPA filters use densely packed layers of glass fibers to catch up to 99% of allergens. Even within HEPA filters, there are a wide range of options to give you the right level of protection from allergens. When you’re shopping for air filters, be sure to look for the MERV rating, which is a number from 1 to 20. The higher the rating, the better the filter is at catching small particles. For homes, a MERV rating above 10 is usually appropriate for allergy protection, but talk with your HVAC professional to make sure it will work with your system. Read our full article on how to select the right MERV rating for your air filter. Even if you have the best air filter in the world, it won’t be very helpful if you don’t change it out regularly. HEPA filters typically need to replaced more frequently than standard filters in order to be effective at removing particles. 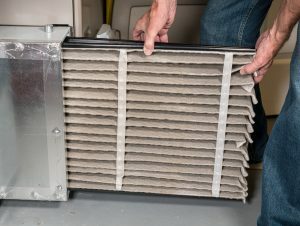 The packaging of the filter will provide a recommendation on how often it should be replaced – but if you have severe allergies or pets, it’s not a bad idea to change the filter more even more frequently. Your air filter is important, but it’s not the only way to reduce allergens in your home. From having your ducts cleaned to addressing ventilation issues, there are many ways you can improve indoor air quality. If you live in the Fredericksburg, be ready for allergy season by scheduling and indoor air quality assessment from the experts at Robert B. Payne, Inc. Give us a call a (540) 373-5876 or send us a message today.